Without fail, every so often a band from outside the borders of Texas and Oklahoma resonate with Red Dirt music fans in a way that the homegrown talent just isn’t doing at the time. We’ve seen it happen with Lucero, Will Hoge, Sean McConnell, Adam Hood, Jason Isbell, Sturgill Simpson and others. Currently that band is American Aquarium. A band heralded and certified as the ultimate road warriors has built up a loyal (and sizable…and growing) fandom in the Texas region. On the strength of a blistering live show that was built on the back of BJ Barham’s intense songwriting, AA is connecting with a wide swath of hungry music fans. As usual, fans down here crave realness. Authenticity. Grittiness. USAq has that in spades. Their last album, Burn. Flicker. Die, was an Isbell-produced collection that solidified them in the scene and beyond. It propelled them from aimless wanderlust to the path of independent success. Their latest album (out Feb 3), Wolves, is the one that is currently elevating them to next-level status. On the heels of a near-breakup, Wolves finds the band settling into a healthy groove both on and offstage. Marriage, sobriety and determination are clearing a new course for this pack of hungry artists. Blazing a trail across the Texas scene like many have done before, but in their own way. It was a slow burn at first. Opening shows in a venue here or there. Gradually, the band began building up its Texas following. Moving up the venue food chain to the choicest joints, bolstered by a booking arrangement with regional booking heavyweight Jon Folk at Red 11. A band can have all the connections it wants, but without the goods to back it up, it will fall flat on its face. AA has the goods, and then some. The hard living of getting to this point almost derailed not just the band’s livelihood, but the member’s actual lives. 300 gigs a year and all the Tuesday nights disguised as Saturday nights had begun to take a serious toll. Pushing through the roadblocks both self-made, imagined and definite, the band has not burned out, flickered or died. They are in fact thriving. Wolves finds them at a creative peak. Their strongest record. As if all the previous records and experiences had brought them to this point. Not necessarily a maturity…but a wisdom. Barham’s lyrical protagonists have transitioned from being the rabble rouser in the middle of the chaos, to the guy full of wisdom at the corner of the bar. Backing this newfound success is a band that’s admittedly the most cohesive they’ve ever been onstage. This solidarity is a good thing. It is no mere coincidence that Biggie Smalls once rapped about mo money, mo problems. The higher the mountain, the harder the fall. The old American Aquarium couldn’t have handled this ongoing pinnacle. 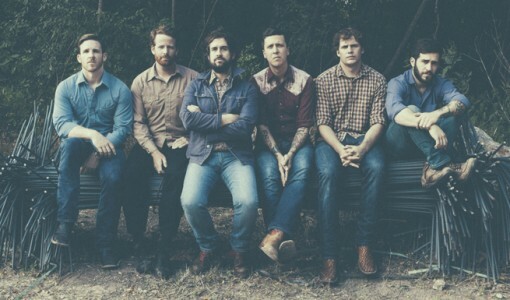 The reinvigorated American Aquarium is poised to sustain, maintain and grow even larger. Texas is better for it. Music is better for it. Time for us all to sit back and enjoy American Aquarium’s newfound life in the bigger fishbowl of success. Wolves will be officially released on Tue Feb 3rd. You can preorder it from our friends at LSM if you didn’t pledge or haven’t already procured a copy. Preview the title track via The Drop.